And did you know that some Russian governmental offices copy design of their websites from Nazi German propaganda posters? See examples in our next post. Don’t they spell McDonalds in cyrillic in Russia? This is probably eastern Europe. I’ve seen very smillar scene in Czech Republic. It’s a shame to me to admit this photo is from my beloved Poland, where I come from. How do I recognize that? The roof of the car visible in the bottom left corner is for 90% root of the Fiat 126p, the car my parents had had for over ten years, I had it too for one year. I would recognize it everythere. I didn’t notice this but my colleagues from work did. must be cyrillic to be in russia? You have to be kidding me! Russia now looks like it is a British colony with many signs being in English, not to mention to words used in speech. But it is true, McDonalds uses Cyrillic in Russia. I don’t see anything shameful or embarrassing about this photo. Its kinda neat. My dad used horses on the farm where he grew up. Development takes time, and its better to use older reliable affordable means of production like a horse, until you can afford more costly and harder to maintain transportation. Also, they just might be having fun. Wouldn’t these people most likely just be out having fun? If they have money for McDonald’s, wouldn’t they most likely own a car? Is McDonald’s that expencive? 😛 As far as I remember its one of kinda cheap place to eat. It’s cheap, but is it cheap to a person who relies on a horse for their transportation? nope. McDonalds is a cheap place to eat in western countries. In middle and eastern europe there are very much cheapier places. What related to me, there are enough of places of that kind to eat, but the’re same on price. Well, in average same. i dont think they have to have a car, but i think its a waste to bother to eat there. why not spend your money on some truly good food? Sometimes it is necessary to choose. Either petrol for the car or Big Mac. It appeared on slovakian pic-post as orginating from Bulgaria, but there they use cyrilic for mcd logo. Photo there still contains metadata from the camera that it was taken with. mcdonalds is absolutely the best! those commies should be grateful that they now have such a privileged to eat burgers. Never take it for granted! mmmmmm i’m loving it…. And here our modern mafia http://ziza.ru/2007/02/26/gimn_gopoty.html . Them name pacan(пацан) or gopnick(гопник). For sure it is poland. such “cars” are still in use and lots of mc-drives are on the borders of cities so people from villages around the city have it on their way “to the work”. usually they have coal or christmas trees when the winter is on (this year it was really hot so it might be that). One tree costs about 5-6 BigMac’s sets. C’mon, you Americans are all the same. For the one that said that Rusia must be grateful for having mc donald’: You have no idea what a tasty meal is. Travel man, travel. In towns is normal to see such scene, not in NY or LA. Go to Alabama! you may find some other interesting things (brother and sister marrying). how is making generalizations about the american south any better than dumb americans in this thread doing the same thing to you europeans? And I thought the point of drive-in was to stay warm in your cozy car while waiting for the food. Actually these guys are probably Gypsy middle class. The poorer Gypsies can’t afford horses so their carts are pulled by mules. Not so uncommon in Eastern Europe. And, no, it’s definitely not Russia, Ukraine, Bulgaria or any other country that uses the Cyrillic alphabet. Additionally, former Soviet Bloc countries have the pinnacle of Russian auto manufacturing available to them, the Traban which is so cheap that even Gypsies can afford one. Ukraine not using Cyrillic on McD. In Soviet Russia, McDonald’s drives-thru you! They’re just having fun…..if they own a horse they probably have a farm….and if they have a farm they probably have food growing there…..and if they’ve got food growing there they probably don’t need to eat expensive mcd food…..so probably they have enoguh money and (their parents) own a car.These kids don’t look 18 years. Interesting, i thought in the US it’s called drive through…or drive thru in some cases, at least in new england i’ve never seen or heard “drive-in” expression. in what part of US people call “drive through” as “drive in”? Trabant was not Russian, it was a GDR car. And i think that the pic is probably from Poland or Slovakia. Or Hungary. 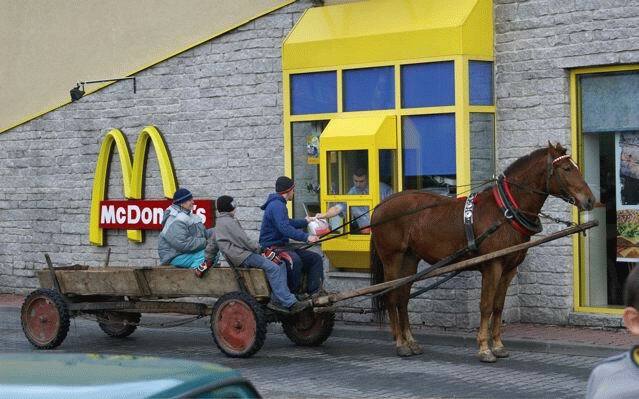 The picture was taken in Poland, I’m not sure whuich retaurant, I hope they ordered something for the horse!